Chicano-Indian American Cultural Center The University of Iowa 308 Melrose Avenue Iowa City, IA 52242 (319) 353-4753 EL LABERINTO STUDENT NEEDS The Chicano-Indian American Student Union is currently deliberating with the University of Iowa, regarding programs and services for meeting the needs of Native American and Chicano students. Any actions taken by the university as a result of these deliberations will affect us all ! ** General CIASU meetings are held every other Monday at 7:30 p.m. at the Center. 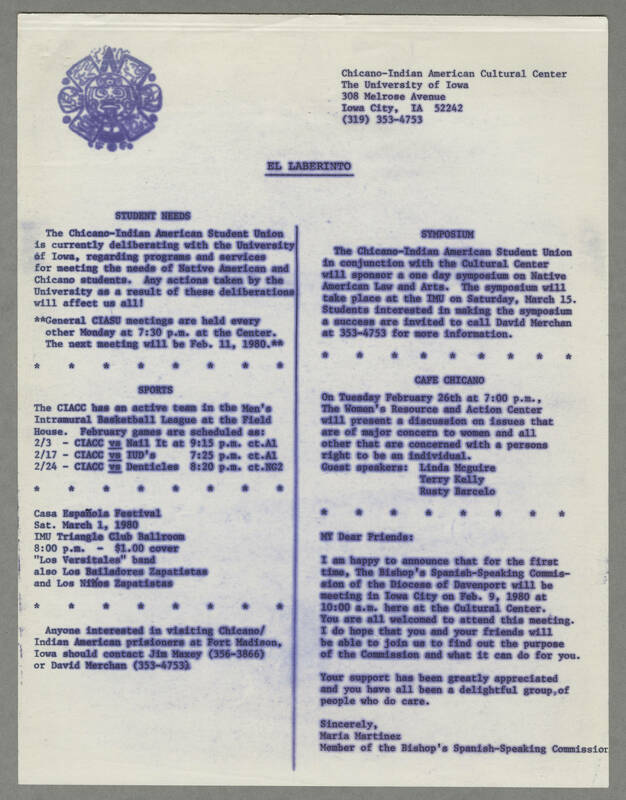 The next meeting will be Feb. 11, 1980** SPORTS THE CIACC has an active team in the Men's Intramural Basketball League at the Field House. February games are scheduled as: 2/3 - CIACC vs Niall It at 9:15 p.m. ct.A1 2/17 CIACC vs IUD's 7:25 p,m. ct.a1 2/24- CIACC vs Denticles 8:20 p.m. ct:NG2 Casa Espanola Festival Sat March 1. 1980 IMU Triangle Club Ballroom 8:00 p.m. - $1.00 covret "Los Versitales" band also Los Bailadores Zapatistas and Los Ninos Zapatistas Anyone interested in visiting Chicano/Indian American prisoners at Fort Madison Iowa should contact Jim Maxey (356-3866) or David Merchan (353-4753) SYMPOSIUM The Chicano-Indian American Student UInion in conjunction with the Cultural Center will sponsor a one day symposium on Native American Law and Arts. The symposium will take place at the IMU on Saturday, March 15. Students interested in making the symposium a success are invited to call David Merchan at 353-4753 for more information. CAFE CHICANO On Tuesday February 26th at 7:00 p.m. The Woman's Resource and Action Center will present a discussion on issues that are of major concern to women and all other that are concerned with a persons right to be an individual Guest Speakers: Linda Mcguire Terry Kellyu Rusty Barcelo MY Dear Friends: I am happy to announce that for the first time, The Bishop's Spanish Speaking Commission of the Diocese of Davenport will be meeting in Iowa City on Feb. 9, 1980 at 10:00 a.m. here at the Cultural Center. You are all welcomed to attend this meeting. I do hope that you and your friends will be able to join us to find out the purpose of the Commission and what it can do for you Your support has been greatly appreciated and you have all been a delightful group of people who do care. Sincerely., Maria Martinez Member of the Bishop's Spanish-Speaking Commission.